YANGON — A middle-aged man sleeps like a log, laid out across a corridor. A few feet away, another man joins him. Nearby, a woman hangs her longyis on a web of plastic ropes. The corridor is inside the Yangon People’s Hospital, the largest public hospital in Myanmar. The colonial-era building, inaugurated in 1899, is being colonized by hawkers, vendors and their families. 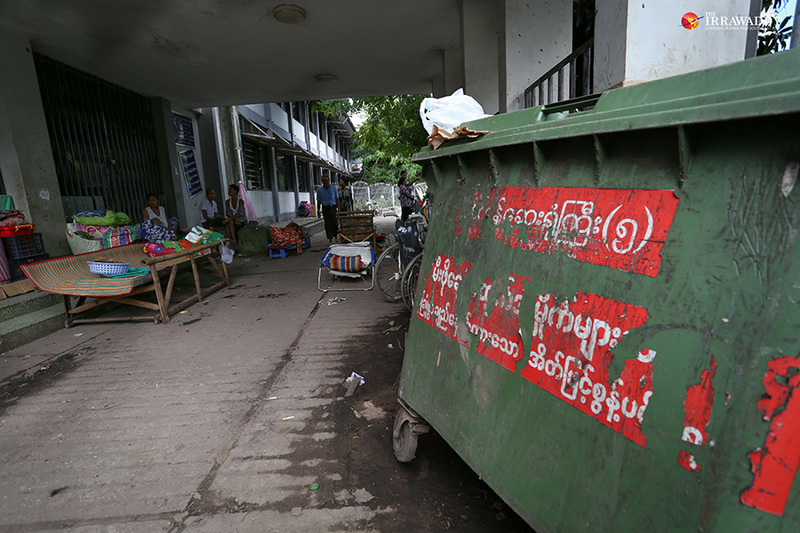 Hospital officials say the hawkers and vendors pose a serious problem to their operations and hurt the image of the 2,000-bed facility, which sits in a 35-acre compound in downtown Yangon. “They not only litter but also relieve themselves in and outside the patient wards. And they also hang their clothes all over the place. 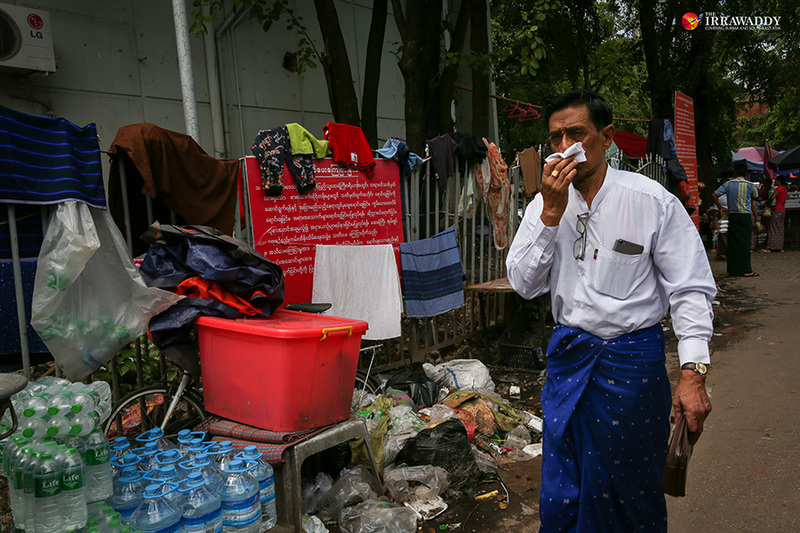 So the hospital doesn’t look good at all,” said Dr. Thein Myint, who heads the hospital’s gastrointestinal department. The hospital has 27 special departments with three operating theaters. It receives approximately 1,800 inpatients daily and has more than 2,000 staff including doctors and nurses. Hospital officials have given permission to only 70 vendors to sell their goods inside the hospital compound for the convenience of patients and caretakers who come from outside Yangon. But in reality hundreds of peddlers are selling their wares at the hospital without permission and ignoring instructions from hospital authorities. Dr. Myint Thein claims that vendors do not even bother to make way for ambulances and emergency vehicles any more, which severely affects hospital operations. The vendors and hawkers sell tobacco and betel quid even though both are banned by the hospital. Some drink alcohol in public while fights and quarrels are common, he said. On a recent visit The Irrawaddy saw empty water bottles, plastic waste and betel nut spit spread all over the ground near the vendors. The problem came to public attention again after a video clip of a brawl between hawkers, reportedly over a gambling dispute, went viral on social media earlier this month. “It is said that the brawl happened near the cardiovascular department. People with heart complaints can die just because of loud noises. I’m sure patients and their caretakers will be quite unhappy to see such a noisy brawl,” said Ko Min Min, who works in Yangon. He said it was also completely unacceptable that vendors and their families were squatting at the hospital. “I’m not clear if the government really doesn’t see it or is turning a blind eye to it. It is not farmland, not a vacant lot in an industrial zone. It is the hospital patients from all over the country rely on. It is unacceptable that the government neglects it,” he said. The number of patients who receive medical treatment at the hospital has increased year by year and vendors find them an attractive market, said Dr. Khin Maung Gyi, an assistant director at the hospital. “As the number of patients has increased, their business has grown. So hawkers from outside the hospital have come in large numbers to sell their goods. And vendors have expanded their stalls beyond the permitted area and even reached under the porticos of the wards. And they sometimes even wander the inpatient wards to make a sale,” he said. Some hawkers interviewed by The Irrawaddy said selling at the hospital was their only means of survival. Hospital authorities have repeatedly ordered the hawkers to leave, but to no avail. “We move when they ask, but then we come back,” one hawker said. Dr. Thein Myint said it will be impossible to make the vendors follow and stick to the rules without government intervention. “Successive ministers and hospital superintendents tried to remove them, but they didn’t succeed. So it would be better to take action according to the laws. Negotiations won’t work. We’ve negotiated with them for more than five years,” he said. 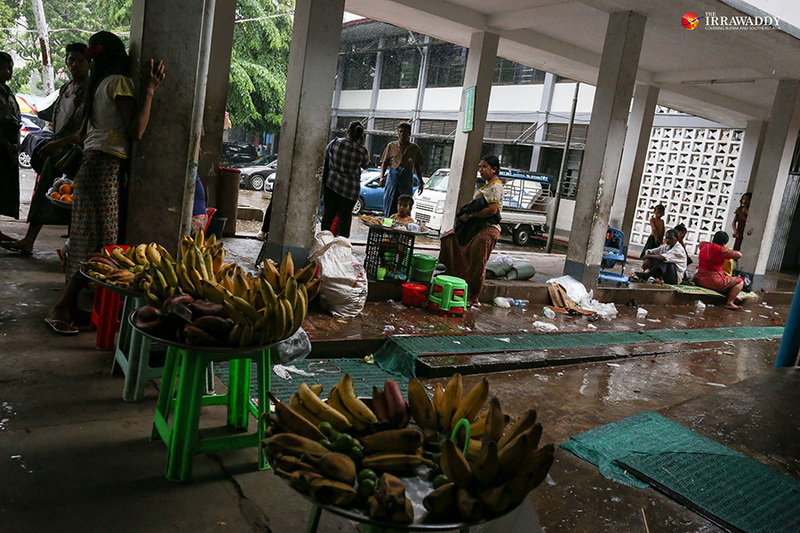 The Yangon Region Parliament’s Committee on Social Affairs, chaired by U Tha Aung, has also urged the regional government to take action against rule-breaking vendors. Asked about the problem, Yangon Region Social Affairs Minister U Naing Ngan Lin told The Irrawaddy he could not comment because he was attending the Union Peace Conference in Naypyitaw and had not yet had a meeting about the issue. Yangon Region Minister for Electricity, Industry and Transport Daw Nilar Kyaw, who sits on the Yangon People’s Hospital’s support board, declined to speak with The Irrawaddy.